b) To observe the relationship of current, voltage and power in a solar cell, and to identify the maximum power point, the short circuit current, and the open circuit voltage. 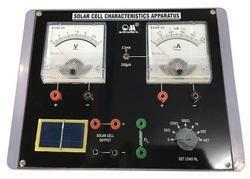 Solar Cell Characteristics Apparatus Objective:- To draw V & I Characteristics of Solar Cell. 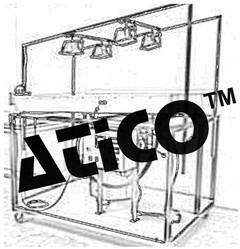 Features:- Instrument comprises of moving coil meters fitted on panel with power supply, Lamp house with power supply, solar cell mounted, optical bench double rod & connections leads. - Plank's Constant Apparatus ( by LED). - Plank's Constant Apparatus ( by Photocell). - Solar Cell Characteristics Apparatus. - Transistor Characteristics Apparatus with Four Analog Meters. Solar Cell Characteristic Apparatus To plot characteristics curve between voltage & current ata different resistance of solar cell. Objective:- To draw V & I Characteristics of Solar Cell. Features:-Instrument comprises of moving coil meters fitted on panel with power supply, Lamp house with power supply, solar cell mounted, optical bench double rod & connections leads.